Parking and Transportation Services (PTS) is responsible for the management of nearly 16,000 parking spaces on campus, including nine parking garages and more than 50 surface parking lots. We are self-funded, and serve Financial and Administrative Services at The University of Texas at Austin. Our dedicated team of approx. 100 full-time and 140 part-time employees strives to satisfy the daily requirements of 70,000 staff, faculty, students and visitors. With a staggering ratio of spaces to people, we use spaces and lots for multiple purposes to accommodate the maximum number of people. Our parking operations include the distribution and regulation of daily, permitted, and event parking, as well as the maintenance of parking lots and garages. We also provide assistance to those parked on or traveling through campus. This assistance includes jump-starts and opening vehicles for those locked out. We welcome you to explore this site further to learn more about who we are and what we do. To be recognized as the most efficient and respected campus parking, transportation, and service programs in the nation. To provide the campus access, mobility, and services through policies that are customer focused, environmentally friendly, and economically sound. 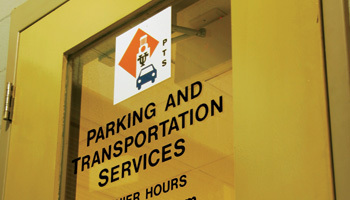 PTS Main Office: Trinity Garage (TRG), 1815 Trinity St.